For thousands of years, Nuu-chah-nulth people living on the West Coast of Vancouver Island have co-existed with sea otters. Sea otter pelts were used for ceremonial robes, dowry gifts and, in later times, for lucrative trade with European, American and Russian traders. In fact, the discovery of the luxurious pelts by Russian and European explorers in the late 1700s sparked such an intense fur trade that sea otters were virtually eliminated from the west coast of North America in just a few decades. By 1911, when an international agreement was signed to end sea otter hunting, only thirteen sea otter colonies remained in isolated pockets throughout their former range (the Pacific Rim, from Baja California to Japan). 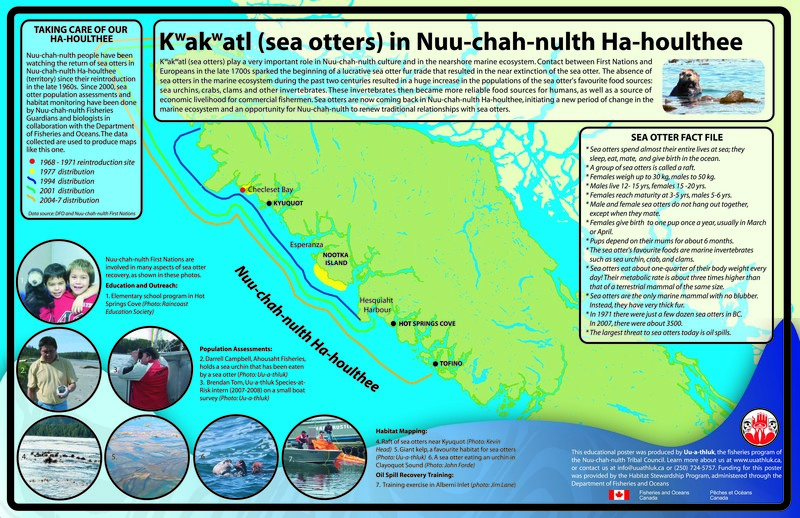 The relationship between Nuu-chah-nulth and sea otters was broken. Although sea otters slowly increased in numbers after the 1911 hunting ban was implemented, Canadian and American government agencies began a translocation program in the late 1960s in an effort to help sea otter re-occupy their traditional range. From 1968 to 1971, sea otters were moved from Alaska’s wester Aluetian Islands to southeast Alaska, British Columbia, Washington and Oregon. Without permission or of consultation with the Nuu-chah-nulth people, 89 Alaskan sea otters were re-introduced to Checleset Bay (off northwest Vancouver Island), in Kyuquot/Cheklesaht territory. 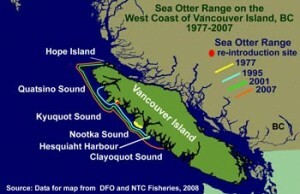 Since then, thenumber and geographic range of sea otters along the west coast of Vancouver Island has grown rapidly. Since their re-introduction, the number and geographic range of sea otters along the west coast of Vancouver Island has grown. In 2007, The Department of Fisheries and Oceans estimated that the sea otter population was approximately 3,500, and that they had repopulated to 25-33% of their historic range in BC. In Canada, sea otters are protected under the federal Species at Risk Act (SARA). Their legal classification as “species of special concern” means that the species may become a threatened or endangered species because of a combination of biological characteristics and identified threats”. Visit the Department of Fisheries and Oceans web site for more information on sea otter recovery plans and community consulations. While good news for sea otters, sea otter recovery is a controversial topic within Nuu-chah-nulth communities. During the sea otter’s absence from the B.C. coast, shellfish species such as crab, urchins, and abalone were able to thrive. Nuu-chah-nulth communities and commercial fishermen became increasingly dependent on these sea resources for food and economic livelihood. Now that sea otters are returning, they compete with Nuu-chah-nulth for favoured foods. Nuu-chah-nulth are challenged to ask themselves difficult questions about the economic, social, and spiritual impacts sea otters are having on their communities. The return of sea otters has opened the doors to discussions throughout Nuu-chah-nulth Ha’houlthee (Chiefly territories) about the role of Nuu-chah-nulth Ha’wiih (traditional Chiefs) to maintain ecosystem balance through Hishukish tsa’walk (everything is one) and Iisaak (respect with caring). In the spirit of these important principles, Nuu-chah-nulth have supported and initiated sea otter recovery efforts, reestablishing the important relationship they once had with the sea otters. In 2000, Uu-a-thluk (the Nuu-chah-nulth Tribal Council Fisheries Program) began a Sea Otter Assessment and Education Project. Working with Nuu-chah-nulth fisheries guardians and technicians, as well as with the Department of Fisheries and Oceans, the NTC’s fisheries biologists have conducted biological surveys, facilitated oil spill response training, conducted community mapping, and raised awareness about the return of the sea otter to the west coast of Vancouver Island (WCVI). Uu-a-thluk is recording data about the number, location and behaviour characteristics of sea otters using small boats and aircraft. 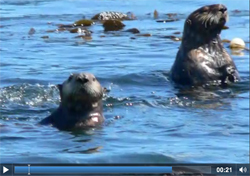 Of particular interest is the location of sea otter rafts, large groups of sea otters that “hang out” together. Oil Spills remain the single greatest threat to sea otters, as even a small amount of oil on an otte’s thick fur can reduce its ability to remain warm, dry, and naturally buoyant. 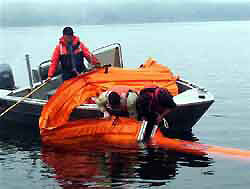 Nuu-chah-nulth and other west coast residents have trained in oil spill response to effectively respond to oil spills on the coast. Knowing the otters’ key rafting areas will help trained residents respond more quickly if an oil spill does occur. 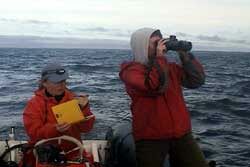 Many residents of the WCVI spend time on the water and have seen sea otters in person. Uu-a-thluk has documented this local knowledge to build a broader knowledge based and to spread the word about the return of the sea otter to the WCVI. 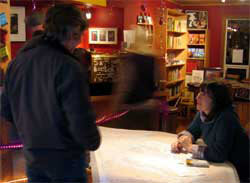 Uu-a-thluk has also been coordinating education and outreach activities with groups like the Bamfield Marine Sciences Centre, the Raincoast Education Society, and the West Coast Vancouver Island Aquatic Management Board. 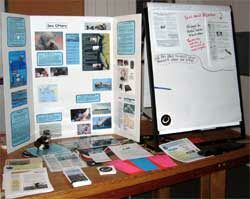 These activities include classroom programs about sea otter ecology and public presentations about all aspects of sea otter recovery, including Nuu-chah-nulth culture and perspectives on sea otters. To download our informative, full colour 11″x17″ sea otter poster, click here.